A comic aside in a future screenplay describing the social history of the smart-phone would show how, for a brief moment at the dawn of the post-human era, its functional value was unexpectedly boosted by its being mounted onto the end of what was essentially a long twig: the proto-tool of ancient primates which begat all human technologies. The selfie-stick is an extension of the post-McLuhan arm, and on its end – depending on the preference of the contemporary primate – one will find an Apple, or other pendulous fruits of our labour; a succulent Samsung, a fragrant HTC. The tree bearing these fructus (let’s not tread far from Latin roots which talk of use, benefit and enjoyment), sheds them each season, but their function is fulfilled during their fall back towards the earth: the dispersal of seeds across a network, reconstituted into texts and images by distant devices, and planted in fertile minds beyond the glassy medium of a reflective screen. The smart-phone on a selfie-stick is an Etruscan mirror for the networked self. Made from highly polished bronze, not glass, the Etruscan mirror was simultaneously a story-telling utensil and a means to review one’s own gaze. Scenes from Greek mythology or religious accounts were often depicted on the rear, just as the iPhone bears the symbol of original sin, hewn from its case by the divine light of a laser. 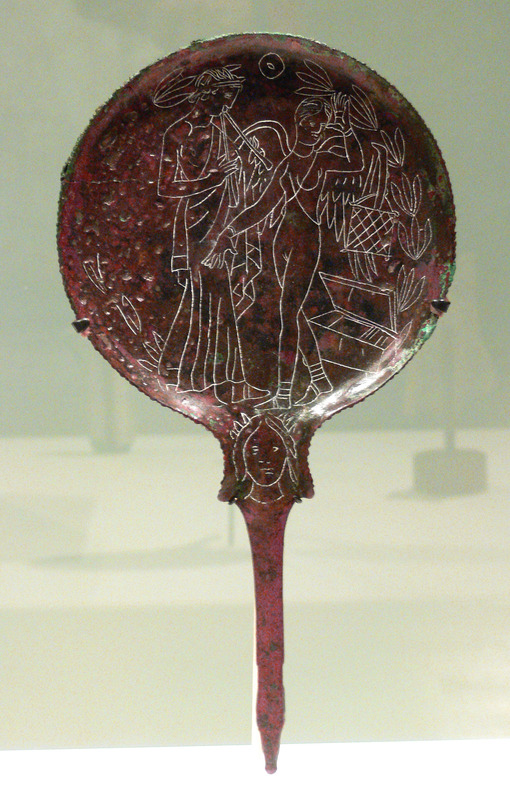 Crucially, the Etruscan mirror was slightly concave: when held at arm’s length, it would have reflected much of the head and torso whilst positioning the user’s reflection within a wider scenery: the self framed within a landscape, and – flipped around – placed in moral relation to a mythical continuity. A reflection in the Etruscan mirror would have been yellowed by the high copper content of the bronze alloy. The self-portrait in the screen is represented by the indifferent disposition of pixels. Neither is a true image: more a fleeting expression of the device’s materiality. The selfie-stick’s trigger is mounted where the thumb would have rested on the wooden handle of the Etruscan mirror: at the point of fulcrum. This configuration ensures a stable image, but now issues a command for the gathering and dissemination of evidence. The mirror stage confirmation of ego is re-fragmented into an imaginary of the body as binary information, and condenses in the memory banks of Instagram’s server rooms. Memoria, the fifth canon of rhetoric, deals with the recalling of accumulated arguments. The 80 BCE text, Rhetorica ad Herennium, calls memory “the treasury of things invented”. The reconstitution of the body as a framed depiction is a rhetorical act of (self)invention: an argument made to assert the ego in time and place, confirmed by a distributed audience with a “like”. The capture of an image is latter-day kairos (καιρός), the right or opportune moment, seized in order to drive an argument home: for Aristotle, the time and space context in which proof is delivered. 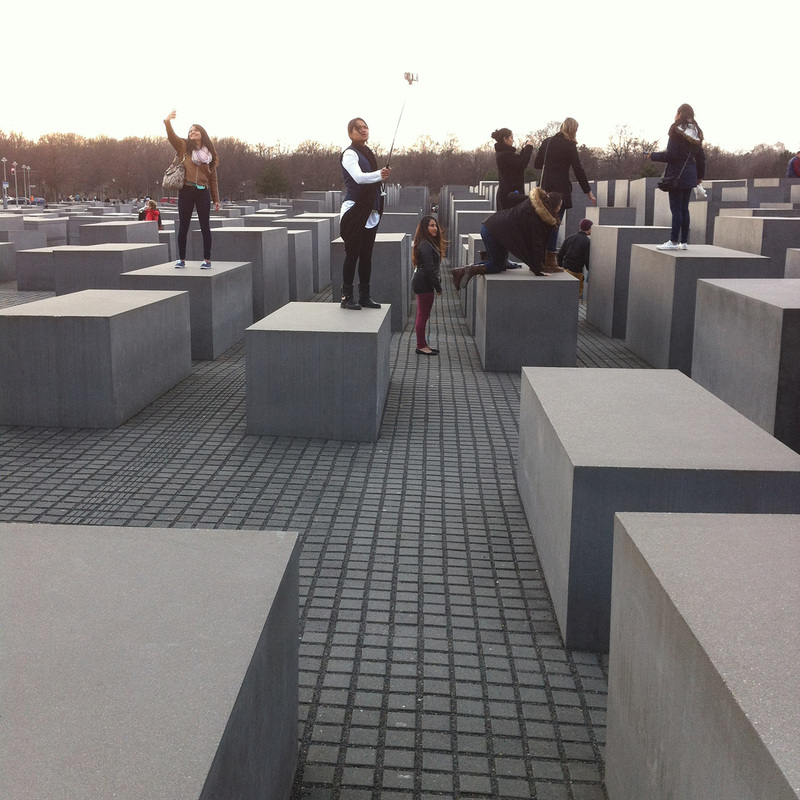 Metadata – date-stamps and geotags – are the aristotelian treasury of Instagram: a gigantic machine for the defragmentation of self, for the collective identification with, and the memory of our specular image.